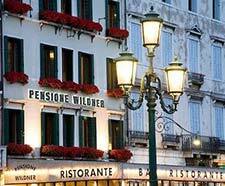 The Hotel Pensione Wildner has a long history, as well as a superb waterfront location amid the luxury hotels on Venice's Riva degli Schiavoni. In the era of Henry James and for much of the 20th Century, the hotel was known as the Pensione Wildner, and that name still adorns the building's façade. Today, the Wildner offers all the usual modern conveniences. You can even bring your pet for free, although you'll need to pay for Wi-Fi. As you leave the Alilaguna Linea Blu waterbus station, turn right and walk along the waterfront promenade. As you leave the boat station at San Zaccaria, look for the Hotel Wildner, which will be almost straight ahead of you facing the waterfront promenade.